One of the best things about Animazement was all the cosplayers running around. Even before we entered the building we passed droves of them outside. I tried to take a few pictures as we went between one end of the building and the other. But it was mostly after we were done with the major attractions that I had time to walk around and hunt for cool costumes. Admittedly, I didn't take that many pictures. I tried to look for particularly interesting costumes, to me at least. Several that I would have liked to take photos of I did not get a chance to. Not only that, but many of the costumes there I didn't recognize at all. I suppose I'm not as big an anime nut as I would like to believe. Of course there were a thousand Naruto costumes there, a series which I really care little about. Apparently Hot Topic carries Naruto headbands and other parapharnalia now, so that might explain a few things. 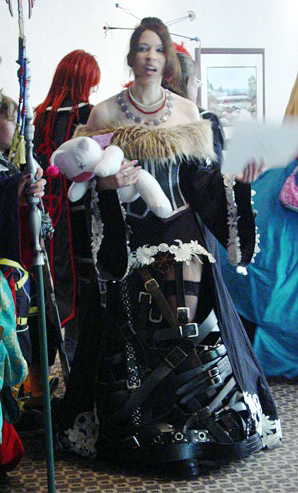 I think that one of the best costumes I saw that day was a particular Lulu, from Final Fantasy X (pictured above). The detail and accuracy of this costume was right on, and very impressive. So many belts. It must have taken forever to get that thing made. I saw a couple other Lulu's there, but none rivaled this costume. So congratulations to whomever created this ensemble. Two other costumes caught my eye, both from Dot.hack//SIGN. The first was Maha, which was simple yet also accurate and effective, and the second was Tsukasa. Though the picture of the latter was not taken by me, I was able to find it on the Animazement forums. This is still one of my favorite anime series, so I was pleased to see some cosplayers representing it. Another great costume I spotted arriving later that night. It was perhaps the most realistic costume, and definitely a well made one also. The character was in green robes, carrying a double-edged sword that was broken towards the end (pictured above). I believe that it was Broken Sword from Hero, though I didn't realize it at first. This costume, and the one of Lulu are my two favorites from the con. I wish I could hand out prizes or something. As mentioned before, I wasn't able to get photos of all the costumes that I saw that day. However, I browsed the Animazement forums and managed to get a few additional pictures from this thread. One of the links therein took me to a site which contains sixty pages worth of Animazement photos. I recommend that you check it out, and you can find that page here. Another page with over 300 photos can be found here. For my little slideshow of cosplayers you can hit this link, and then view this awesome panorama shot of a bunch of cosplayers. I hope you'll find it vicariously entertaining. Seeing all the cosplayers running around the con was one of the best things about Animazement. It certainly has given us a lot of ideas, and I think we'll try to come in costumes next year. Though there certainly are a lot of options for Nikki, I am a little more limited due to my facial hair. I don't like the prospect of shaving it all off just for one weekend, so I'll have to find the appropriate character to match. Maybe I'll even post about it ahead of time, but I may just want to surprise everybody.